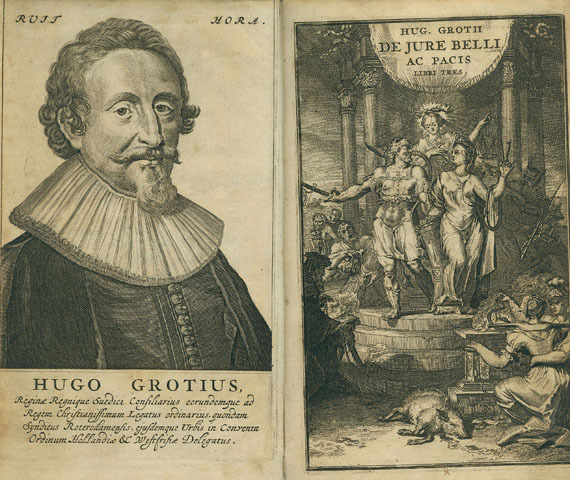 Grotius, H., De iure belli ac pacis libri tres. 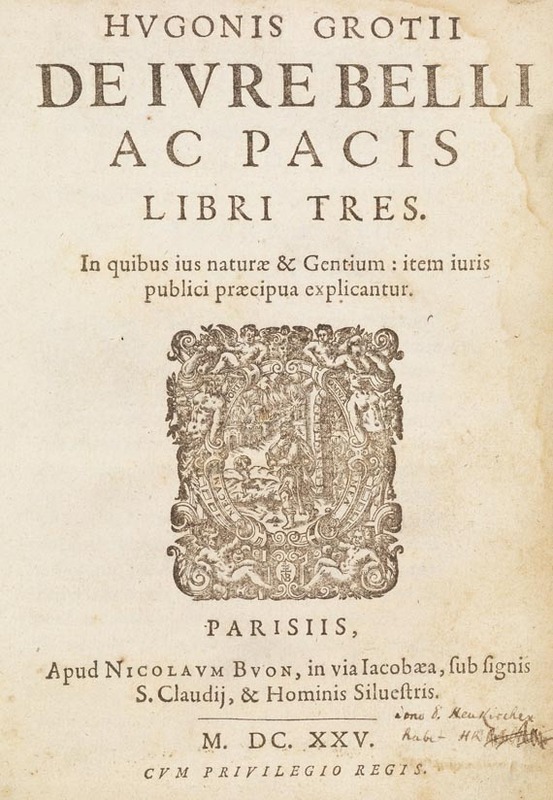 In quibus ius naturae & Gentium: item iuris publici praecipua explicantur. With woodcut printer's device on title. Paris, N. Buon 1625. Contemp. vellum binding with lettering on spine. 4to. Title, 14 ll., 785 (recte 739) pp.Ter Meulen/Diermanse 565.1. - PMM 125. - Stintzing/L. III,1, 1ff. 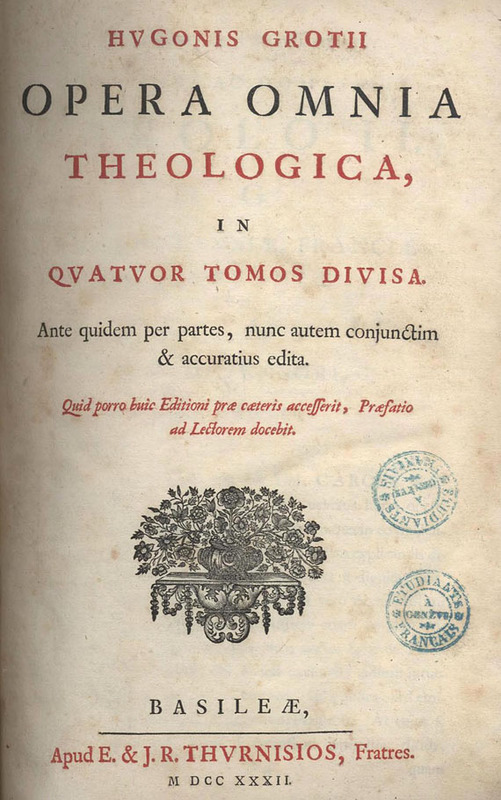 - First print of the first edition , with all features mentioned in Ter Meulen/D. Of outmost rareness! 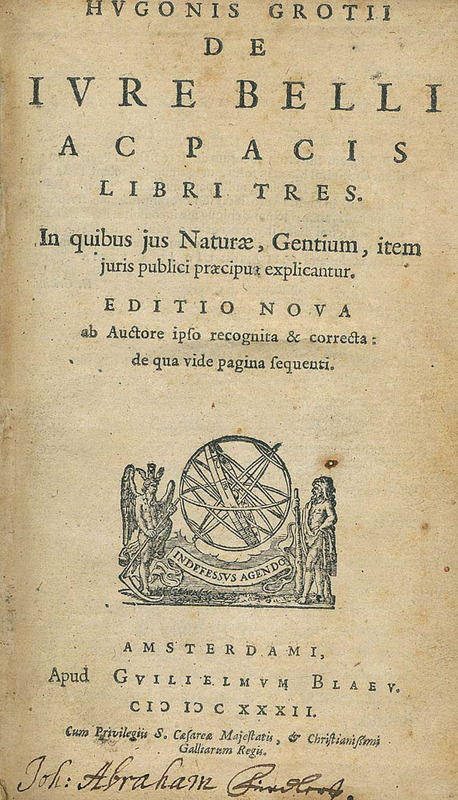 Our research did not find proof for another copy, neither in libraries nor in public collections or commerce, except for the one in the Bodleian Library Oxford from the ownership of John Selden, which served as the basis for Ter Meulen's description. Additionally, the relevant registers and catalogs do not deliver information on other copies in auctions or commerce. 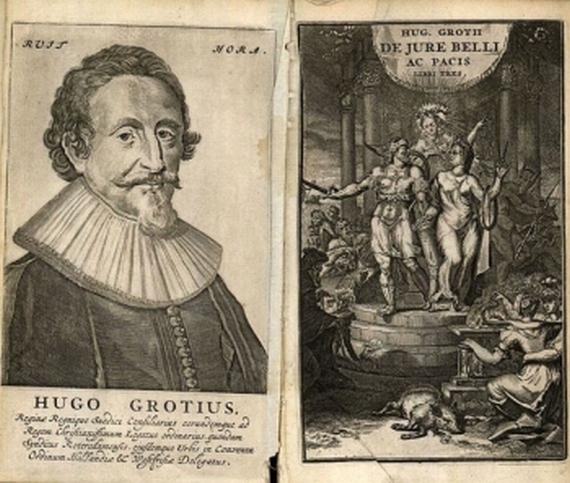 According to the Rare Books Departement of the Bodleian Library no other copy is known of.According to Ter Meulen, this first print was made in hurry, so that it would be complete for the Frankfurt Book Fair (Easter 1625). 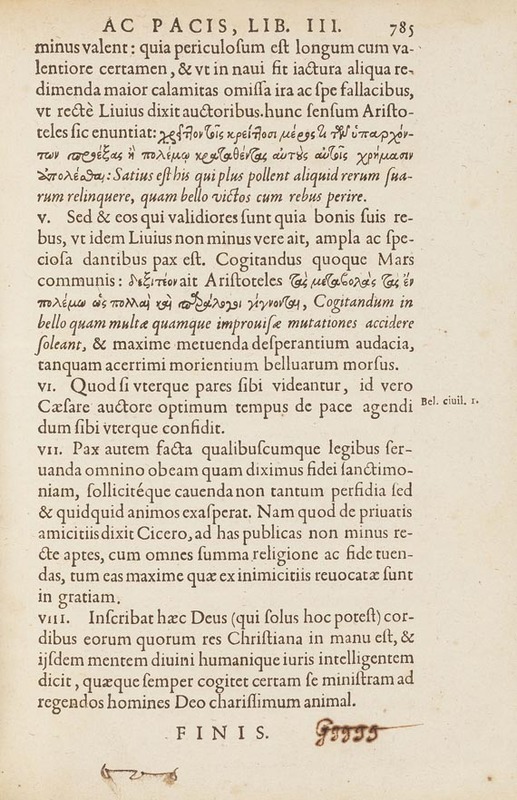 It was executed on two or three presses at the same time, as the preparation for printing - ca. since late 1624 -had been slow-going. 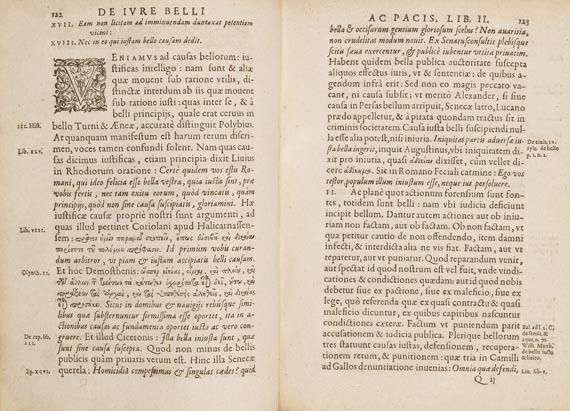 The print had not been completed by late March 1625, the index was incomplete, some page erroneous, so that the work was eventually sent to the book fair lacking all indices and table of content and with the uncorrected pages. Only the following two prints were completely revised and published the same year. Both are also quite rare in commerce. particularly the second print, which had only been offered once in the recent decades (auction at Christie's 2004, hammer prices 154.700 dollar).Lacking last 2 blank ll. after p. 506. - Slightly discolored in places, with slight traces of damp in places. 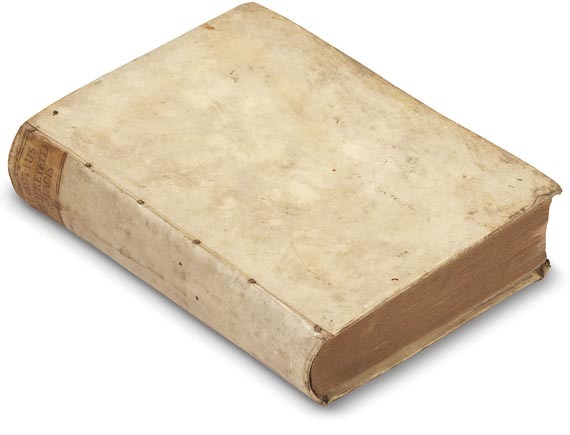 Well-preserved and unsophisticated copy in contemporary vellum binding . Like the copy in the Bodleian library with ms. sheet signature "Ggggg" in brown ink on recto of last sheet.